What would Sweet Dreams Day be with out the heat and humidity? 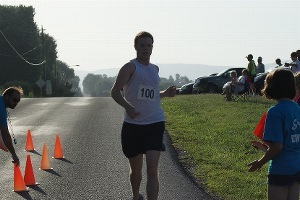 I think Eric Pricthitt ( NBC29 ) likes running in heat. It seems like all of his predictions for the event over the years carry the same message “Hot and Humid”. Eric came in first again in the Men’s Over-40 division. I wonder if he will defend his title and ask Mother Nature for another hot day next year. Congratulations Eric for your achievement, and thank you for your help at the main event at the Stuarts Draft Park. Congratulations also to the other 5k division winners, and to all the runners that participated. It takes an enormous amount planning and energy to put on an event like Sweet Dreams Day. My sincere thanks to all the volunteers that helped run the events, direct traffic and make people feel comfortable. The Sweet Dreams Committee and the Augusta County Parks and Recreation folks did an outstanding job pulling the entire event together. Job well done! My day started at 7:00 am, arriving at Schnieder Park to a parking lot full of cars, I had a feeling the attendance was up. Sonny Cubbage felt the same. When the race actually started, there were 145 runners, walkers and strollers. Both Sonny and I missed seeing Lucas Moffit take off. My first photo of him was when he returned to the finished line. What surprised us both was Lucas was pushing a stroller and finished in 8th position overall with not one, but two children along for the ride. Sonny looked at me and said “We need a stroller division!”. So next year, there might be two new divisions, a One-Seat-Stroller and a Two-Seat-Stroller. It was great to watch and hear “Faster Dad”. The little riders have a great view and they encourage you to push faster. Boy I would to be a little kid again and go for a ride!